When I first came across this book several months ago I wasn’t sure I really wanted to commit to reading what I just knew would probably be a depressing, tear jerker of a book. Don’t get me wrong I love good emotional books, but it’s like pulling teeth for me to go into a book knowing its probably going to leave me depressed. But, like many of you, my TV began to be flooded with the trailer for the movie version, it’s like The Fault in Our Stars was screaming at me from every which direction to just get over my reservations and jump on in! I am so glad I jumped because this book was nothing like I feared. Yes, I cried but instead of being depressed it was almost as if it left me feeling uplifted. I know crazy right? How could that possibly come after reading a book about teens with cancer? Honestly, it’s hard to explain but if you don’t read any further in this review, please just know I think this book is one everyone should read. Don’t miss out because you will not be able to walk away unchanged. 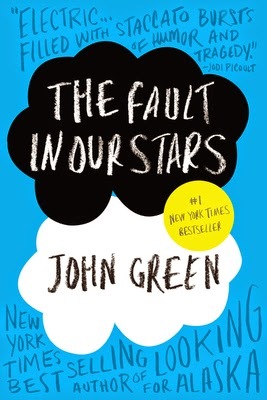 The Fault in Our Stars is powerful, emotional, wonderful and its a definite must-read! The Fault in Our Stars is told in the voice of main character Hazel. A young teen who has been fighting cancer on and off for the last several years and who now needs the assistance of a breathing machine. The cancer keeps trying to claim her life but her body isn’t ready to give up. She has good days and bad ones and outside of her parents and the support group she is forced to attend she spends her life watching reality TV, taking classes at the local community college, and reading. She’s read her favorite book, an Imperial Affliction, more times than she can remember, it’s as though the author is speaking directly to her. Like he knows all about her and her fight with cancer. The book’s ending is abrupt, just like her life potentially could be, and she desperately seeks the answers as to the outcomes of what happens after. One day at cancer support group she meets new comer Augustus. She finds herself intrigued and these two start off down the road of friendship, eventually falling in love. Augustus has never met anyone quite like Hazel and he cannot help but fall for her, however, hopeless it may seem to fall for a girl whose dying. These two and their passion for an Imperial Affliction leads them on a quest to meet the author and finally have their answers. I loved both Hazel and Augustus. Their outlooks on cancer and their life, came across as genuine. They’re just teenagers who drew the short end of the stick of life. Forced to grow up and miss out on some many rites of passage. Their stuck between death and life, trying to make the best out of a crap situation. Their friendship, camaraderie and love for one another completely changes each of them. I truly enjoyed seeing them find their humor in such crap circumstances. Honestly there were multiple points in this story that I found myself crying ugly tears while laughing hysterically. Obviously this was written by an incredibly talented, genius of an author. Please take my advice and read The Fault in Our Stars for yourself, I don’t believe there is any way you can walk away from the experience disappointed. I just hope the movie turns out as great as the book!